Silence has fallen over the minibus. The last conversations and the radio have died down while the driver concentrates on the winding road cutting through the mountains. The passengers’ gaze falls into deep canyons, on the fall-colored forests and on the mountains in the distance which, together with the sinister clouds, exude a menacing aura. In Nikšić we had to change from a normal-size bus to a minibus. 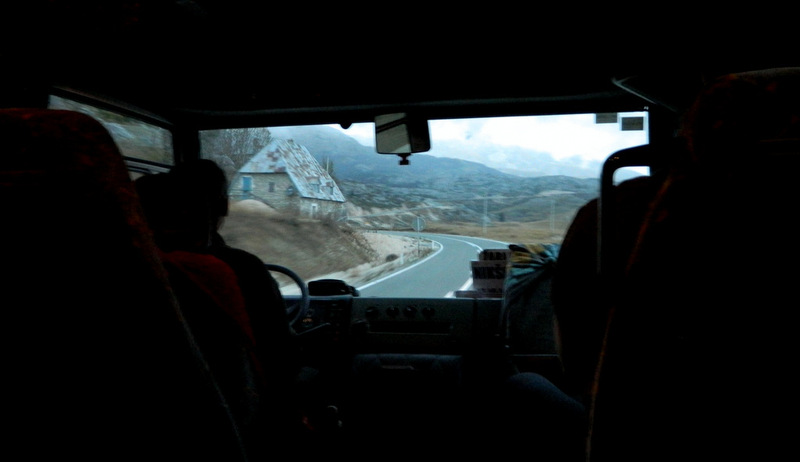 The roads on the way to the Durmitor mountains in Montenegro are too winding and the incline is too steep for regular coaches. Maybe the bus company also tries to limit its financial risk, if ever a bus would stray from the road and crash unsavably into one of the canyons. A woman gets off the bus in the nowhere, carrying several shopping bags. I don’t see any house around, nor any settlement. On the map, the next village is 10 km away. Close to the pass summit, there is a sofa next to the road. Relatively new, but without any discernible use at this forlorn place. It keeps getting darker. The clouds are heavy and hanging so deep that it’s impossible to tell where they stop and where the fog begins. The sun is not cognizable. It isn’t night, it isn’t yet dusk, but it doesn’t feel like daytime either. It’s like an unidentifiable time of day which was created for this place alone. Every five or ten kilometers, someone steps off the bus. Nobody has gotten on since Nikšić. Around two hours later, a high plateau opens up with wide meadows, a few cows, sporadic houses, half of them decayed, the other half warped by the wind. A rough, barren landscape. The few houses are far apart from each other. The scene looks like the painting of someone who didn’t want to waste the dirty residue colors in the paint-box and therefore quickly scribbled something in grey, black, brown and sallow dark-green. Faded color photos from World War II look exactly like this. Or the Scotland scene in Skyfall. It doesn’t rain, it doesn’t storm, it doesn’t thunder, as if the dark, close clouds are satisfied with posing the constant threat of severe weather. The heating on the bus warms my feet, but my upper body is freezing. Some of the passengers have put on their caps. Still no word is uttered. It’s a feeling like on a ride into the dangerous unknown, as if winter will break out in the next few days and we will be trapped up here for a few months. Žabljak lies at an altitude of 1,455 m (4,773 ft) and is the highest town in the Balkans. The airport ceased to operate long ago. At this moment, I cannot imagine that summer would ever find its way here. The grey mountains stand to the sides of the wide valley like curses that became stone, as if they would want to keep out anything happy, colorful, lively. 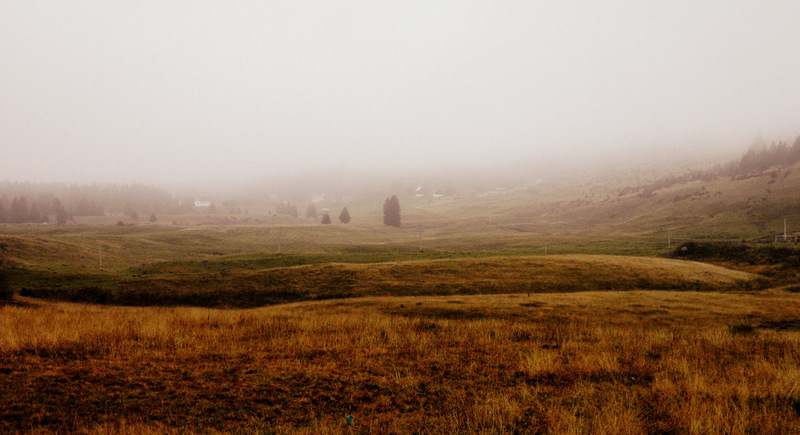 They would cast dark shadows on the withered meadows, if only the sun got through the fog and if the bleached grass was receptive for shadows. When we arrive, only three passengers are left on the bus. Final destination. It’s ice-cold. A jittering man at the bus station offers me a guest room for 9 € per night. Unfortunately, I already booked something, for 15 € per night. And for three days. Three days at this eerie, inhospitable, cold, colorless place. Tomorrow will be Halloween. Addendum: For the sake of fairness, I should mention that after two days of foggy murk, the sun broke through and it became very beautiful indeed. 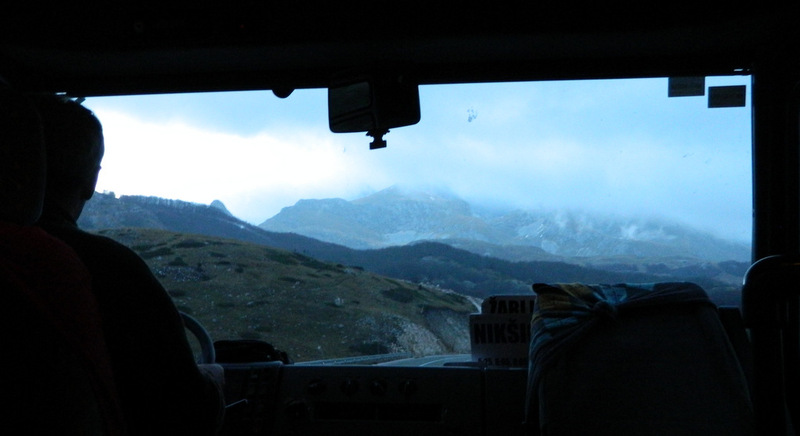 Due to this contrast, the Durmitor mountains have taken up a special place in my travel memories. Addendum 2: The mood which I experienced and described is depicted very well in a film by National Geographic. I didn’t run into the old lady with the rifle unfortunately. 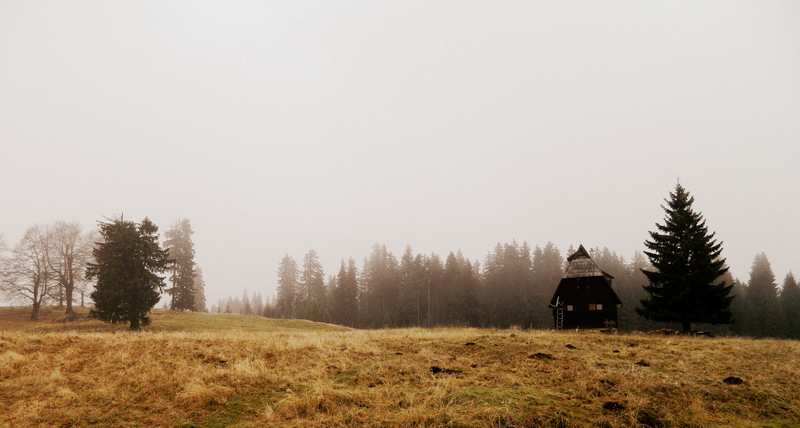 This entry was posted in Montenegro, Photography, Travel, Video Blog and tagged Durmitor, Zabljak. Bookmark the permalink.